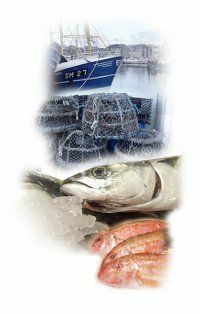 RG Seafoods was established in 1993 supplying fresh fish and frozen seafoods in South East Cornwall to the general public and the catering trade. Rob Goodacre established the business after several years working on fishing boats and then moving on to become a buyer for an international exporter. The business started initially from market to van to customer and has grown from strength to strength year on year priding itself on supplying premium West Country fish at affordable prices without compromising service or quality. RG Seafoods delivers to the catering trade Monday to Saturday throughout the year with the exception of bank holidays. We deliver prepared and whole fish in temperature controlled vehicles to maintain freshness and quality. We are a small firm consisting of husband and wife team with one or two staff maintaining high standards with a very personal customer supplier relationship. RG Seafoods purchased and moved into purpose made facilities in Torpoint high street in July 2011. This opened a larger window to the retail trade to compliment the mobile van sales already well-established in South East Cornwall. The retail shop is named the fish store and sells many items to compliment the quality fresh fish and seafoods that we sell. So for further information on the products we offer, then please call RG Seafoods today on 01752 814040 or you can send an email by clicking here and filling out the form. We look forward to hearing from you.